 I have reviewed the submissions of the parties and have concluded that it would be appropriate and would properly serve the interests of justice if this matter was adjourned. While the Supreme Court of Canada has ruled in Canada (Human Rights Commission) v. Taylor, 1990 3 S.C.R. 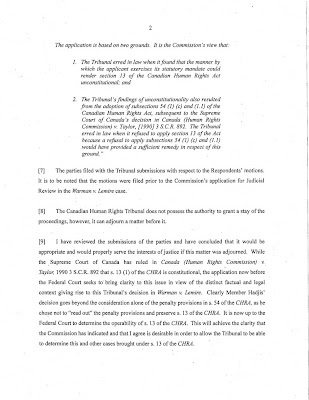 892 that s. 13 (1) of the CHRA is constitutional, the application now before the Federal Court seeks to bring clarity to this issue in view of the distinct factual and legal context giving rise to this Tribunal's decision in Warman v. Lemire. 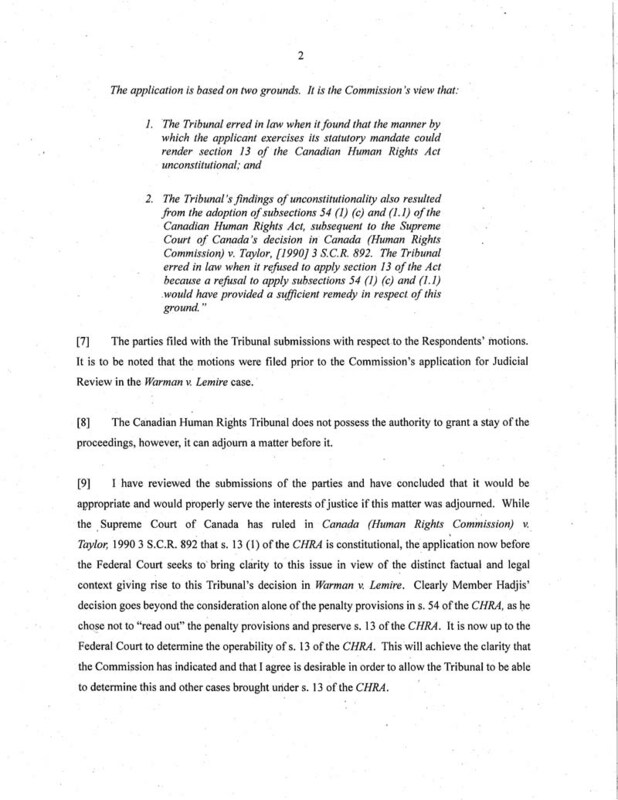 Clearly Member Hadjis' decision goes beyond the consideration alone of the penalty provisions in s. 54 of the CHRA, as he chose not to "read out" the penalty provisions and preserve s. 13 of the CHRA. It is now up to the Federal Court to determine the operability of s. 13 of the CHRA. This will achieve the clarity that the Commission has indicated and that I agree is desirable in order to allow the Tribunal to be able to determine this and other cases brought under s. 13 of the CHRA. For these reasons I hereby adjourn these proceedings sine die pending the final outcome in the Warman v. Lemire case. The Tribunal member in this case was Edward Lustig. 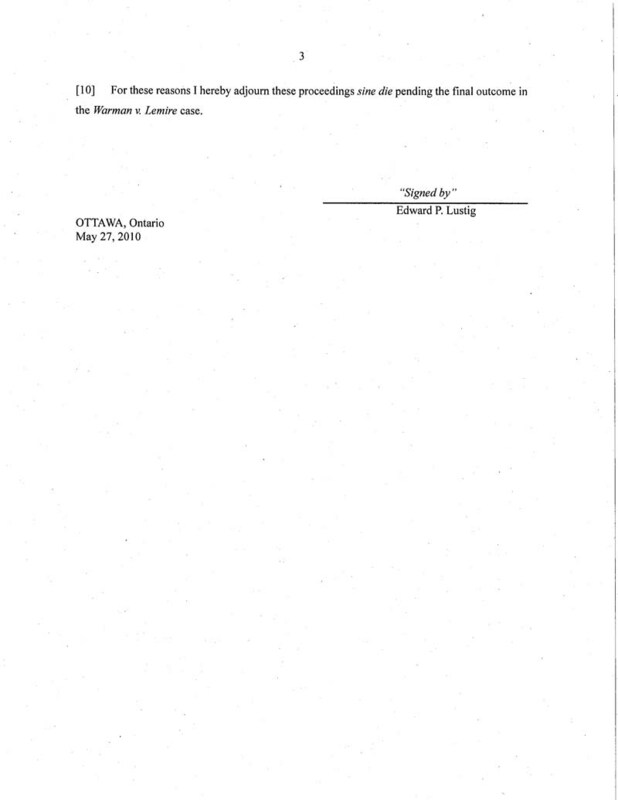 He came to light in a recent ruling in the Ouwendyk case, where he slammed Serial complainant Richard Warman. This is a ruling concerning a motion by the Respondent dated September 4, 2009 for an adjournment of this matter sine die. The complaint in this matter was filed by the Complainant on January 29, 2007. 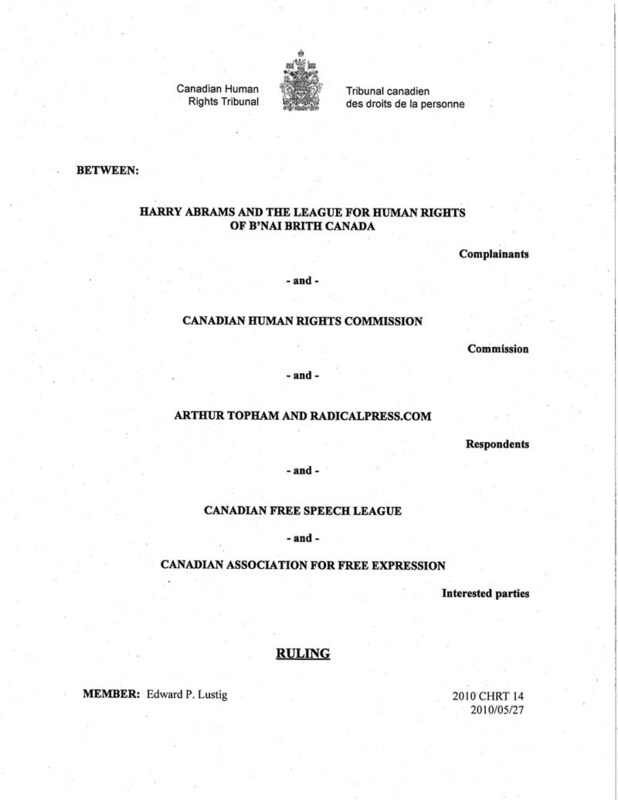 The complaint alleges that the Respondent communicated messages over the internet that were likely to expose members of the Jewish community to hatred or contempt by reason of their membership in an identifiable group contrary to s. 13 (1) of the Canadian Human Rights Act (the "CHRA"). The complaint alleges that the impugned conduct occurred in a manner that was ongoing. 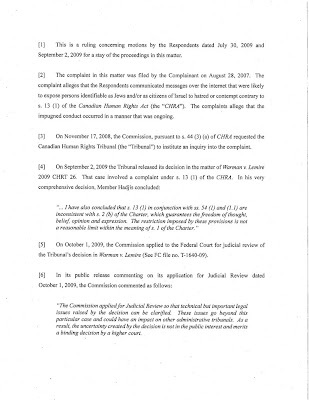 On September 16, 2008, the Commission, pursuant to s. 44 (3) (a) of CHRA requested the Canadian Human Rights Tribunal (the "Tribunal") to institute an inquiry into the complaint. "... I have also concluded that s. 13 (1) in conjunction with ss. 54 (1) and (1.1) are inconsistent with s. 2 (b) of the Charter, which guarantees the freedom of thought, belief, opinion and expression. The restriction imposed by these provisions is not a reasonable limit within the meaning of s. 1 of the Charter." 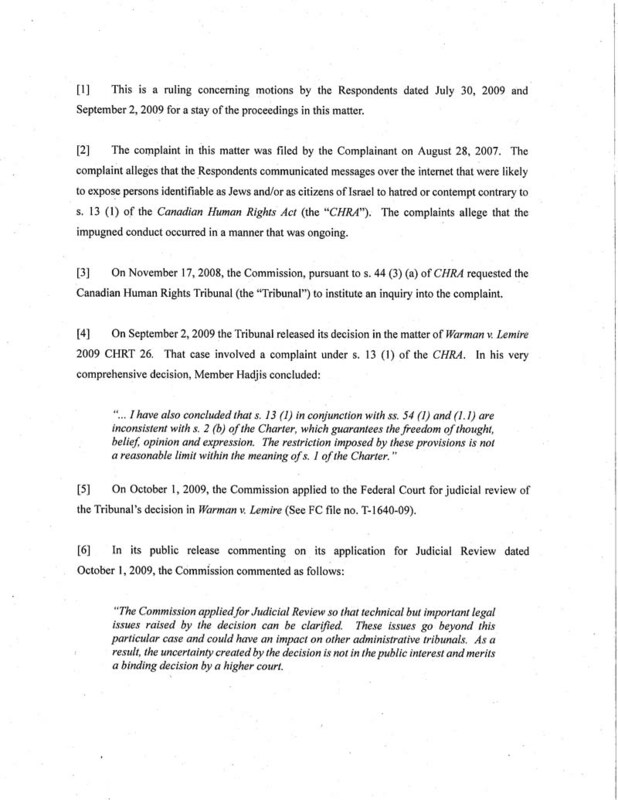 On October 1, 2009, the Commission applied to the Federal Court for judicial review of the Tribunal's decision in Warman v. Lemire (See FC file no. T-1640-09). "The Commission applied for Judicial Review so that technical but important legal issues raised by the decision can be clarified. These issues go beyond this particular case and could have an impact on other administrative tribunals. As a result, the uncertainty created by the decision is not in the public interest and merits a binding decision by a higher court. 2. 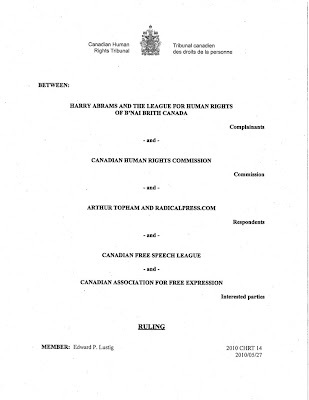 The Tribunal's findings of unconstitutionality also resulted from the adoption of subsections 54 (1) (c) and (1.1) of the Canadian Human Rights Act, subsequent to the Supreme Court of Canada's decision in Canada (Human Rights Commission) v. Taylor,  3 S.C.R. 892. The Tribunal erred in law when it refused to apply section 13 of the Act because a refusal to apply subsections 54 (1) (c) and (1.1) would have provided a sufficient remedy in respect of this ground." The parties filed with the Tribunal submissions with respect to the Respondent's motion for an adjournment. 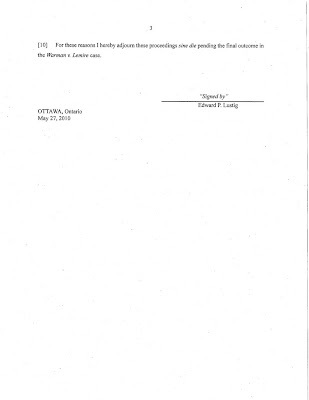 It is to be noted that the motion was filed prior to the Commission's application for Judicial Review in the Warman v. Lemire case. The case against Authur Topham and the Radical Press has been adjourned Sine Die also.